Seriously? This is Trump's fault? David Zonsheine from the guardian must think Israel cares who the US president is. It's no coincidence that Trump's main man and most trusted advisor Jared Kushner, is deeply loyal to Israel and it's Zionist rulers . not my country not my problem, that's what I always say. Let them sort their own mess out. That's the way it has been for thousands of years. You can say that but how long until we are over there to fight another middle east war? I wish we would "Let them sort their own mess out." Let them die in their own wars for a change. It's no coincidence that AIPAC funds a lot of Republican elections. Sometimes I wonder if that old shepherd, stumbling around in the dark and cutting animals in half, had any idea that his rantings about a visitor would have had the effects it has brought upon this world. I also wonder what it was he might have been smoking to see the things he said he saw. Another thing I find worrisome is many people will support this simply because they worship Trump and Trump is an Israeli puppet so anything supports so must the Trump supporters. I saw it with the whole Jerusalem embassy event, old members who used to make daily threads against Israel now support Israel because Trump does. I wish I was allowed to call them out by name. Im a Trump fan and the only thing hes done/said so far that I disagree with is his support for Israel. Hes either playing the obedient goy or hes been compromised. I just loved at the end of the article how they had to throw in a bit of Trump hate, classic stuff. You're right they'll come here and say there's no such thing as Palestinians and deflect from the fact that the people of Israel treat the Natives of that land almost as badly as Hitler treated their ancestors. These comparisons always boggle my mind, especially considering the Palestinians were actually allied with Hitler and still indoctrinate their population with nazi'eque propaganda about jews. 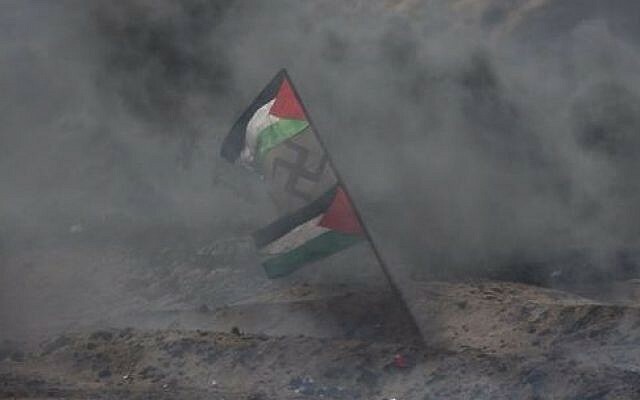 During the border attacks last month they were flying kites with swastikas on them over the border! Both sides are wrong in one way or another as this link proves Israeli children are just as indoctrinated. I'd also like to add that Yes I acknowledge extremists from Gaza do launch rockets into Israel but it's also probable that some of it is done by mossad to promote hate and fear among the people. Israeli Hasbara knows no boundaries. That nazi kite honestly looks like an inside job/psy op imo but I could definitely be wrong. 1 Village down several thousand to go. The international lobbyists have a lot of decision making power, that's for sure. They all speak against lobbying but all profit from it. I can't just blame Trump lol. Obama made a lot of crooked deals as well.